Ban condemns detention of four UN peacekeepers monitoring cease-fire line in Golan Heights. Following alleged Israeli air strikes near Damascus over the weekend, Syrian authorities have considered allowing Palestinian armed groups to launch attacks against Israel across the Golan Heights border, Syrian daily Al Watan reported on Monday. 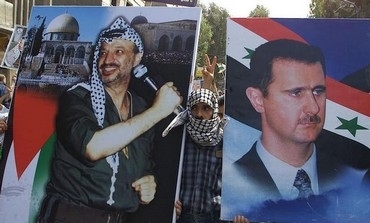 According to the report, the initiative was set to be discussed in upcoming meetings between Syria and Palestinian faction leaders, said Khalid Abd al-Majid, secretary-general of the Palestinian Popular Struggle Front. In light of recent developments, Syria has the "right and duty to respond using all available means," Majid was reported as saying. Majid's faction is close to the Syrian regime, and the strength of the forces under his control is subject to dispute. Prof. Eyal Zisser – an expert on Syria at Tel Aviv University's Moshe Dayan Center – told The Jerusalem Post he doubts the report because there is no real presence of strong Palestinian forces that would be able to carry out such an attack. However, Zisser did not rule out the possibility that Syrian President Bashar Assad might attack Israel in an indirect manner, via a third party. Regarding the alleged Israeli strikes against Syrian targets, the Sunni-Arab media seems to be pleased by how weak Syrian air defenses appeared in failing to defend the country from the strikes. An article by Tariq Alhomayed in the Saudi-backed London-based daily Asharq al-Awsat stated that the US has been exaggerating Syria's air-defense capabilities, and called upon the US to attack Syria already. "The Syrian regime is like a dead body waiting to be buried – this is what the Israeli air strikes demonstrated," he said. "The question, therefore, remains the same as it has been since the beginning of the revolution," Alhomayed wrote. "What are the Americans and the international community waiting for in order to intervene?" Matthew RJ Brodsky – director of policy at the Jewish Policy Center, a Washington- based think tank – told the Post that it appears the strikes were carried out from Lebanese airspace. "Nevertheless, Syrian or Russian SAM operators should have still been able to pick up or track Israeli planes in Lebanese airspace," he said. "Syria is considered to have one of the better air-defense systems in the Middle East. Yet while Syria's SAM network appears very robust on paper, it is more flimsy in practice – especially when faced with a major air incursion launched by a modern opponent," said Brodsky. He added that the main deficiency with the system is that it only has single- target engagement capability and is vulnerable to planes flying at low altitudes. Syria is also known to employ the more advanced SA-6 tactical system, which is mobile. Brodsky notes that Syria has around five SA-5 sites, part of a longrange defense system for protect the country along its western border into the Mediterranean. Asked by the Post if the feeling in Washington is that an Israeli strike made US intervention more likely, he said that the strikes have certainly increased the focus on the Syrian war. "Coming as it did on the heels of the revelation that chemical weapons were recently used in Syria, both sides of the political aisle are really considering expanded US options in Syria," he added. Meanwhile, UN Secretary-General Ban Ki-moon strongly condemned on Tuesday the detention of four UN peacekeepers monitoring the cease-fire line between Syria and the Golan Heights, and called for their immediate release. "The secretary-general calls on all parties to respect UNDOF's [UN Disengagement Observer Force] freedom of movement and safety and security," Ban's spokesman Martin Nesirky told reporters. The Post asked UN spokesman Farhan Haq if the secretary-general is worried about the increasing frequency of this activity in the Al Jamla region, to which Haq replied that "further to the abduction of 21 peacekeepers on March 6, UNDOF reviewed its security arrangements to implement its mandate and ensure the safety and security of its personnel." He added that "different scenarios and arrangements are being considered to continue operating in these difficult and challenging circumstances."